While not all unexpected events are negative, generally, the big ones will affect your financial future. This means you may need to change the way you think about and handle your money. A little planning (and saving) now will make these emergencies and unexpected events much easier to handle when they come your way. Even the most careful planner may be taken by surprise with the news that they had not planned or prepared for. The best way to handle these events is to prepare for the unexpected in advance. So how can you do this? Have an emergency fund to pay for that unexpected medical bill or house repair. Take out insurance policies on your car, home, and even yourself, in the form of a life insurance policy. Have some easily accessible, liquid cash on hand, just in case. While you certainly can’t plan for everything, it is nice to know you have a contingency plan in place when things go awry. Keep in mind that once you experience an unexpected expense, you may need to reassess your current plan and make changes. The first step for preparing for the unexpected is to have a solid emergency fund in place. Your emergency fund should be relatively liquid and should cover 3-6 months of living expenses. If you are single, or you are a single-income family, you may want to consider building an emergency fund of up to a year, which will provide security for you and your family should you lose your job and have a hard time finding another one, or suffer an unexpected illness or gap in your earnings. It is nice to know you have the money there while you are dealing with other issues such as a job loss, illness or anything that might affect your income. And if you don’t think you need an emergency fund, you may want to consider these eight reasons to have an emergency fund. Remember, you do not want to be thrown off by small unexpected expenses. It is important that you have adequate life insurance for your family or your spouse if you are married, and especially if you have children. The life insurance should provide enough money for your family to pay off any debt and live on after you pass away. If you have children you should get enough that it can help cover the cost of their education. This bears repeating: It is vital that you have life insurance coverage if you have children. Additionally, you should make sure you have adequate health insurance coverage, and renter’s or home insurance coverage. While you may be adding bills to your monthly budget, having this coverage will save you in the long run. Many people gamble with not having health insurance coverage because they feel that they are in good health and do not need it. But accidents happen, and medical bills add up quickly. All it takes is one serious illness or accident, and you could find yourself deeply in debt. Depending on where you live, it may be wise to plan for is natural disasters. The last few years have shown just how devastating these disasters may be. They can come upon you suddenly, and you need to be prepared to deal with them. Consider tornado, hurricane, flood, or earthquake insurance if these natural disasters are common where you live. Additionally, a good emergency kit with a five-day supply of food and water is good to have on hand in your home, car or office. The kits do not need to be very large or elaborate, but they can make a difficult situation much easier to get through. 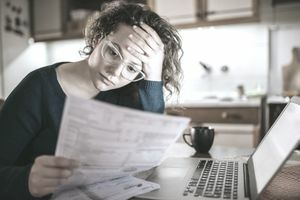 Finally, you may want to sit down and create a fallback budget of the things you could cut back on if you needed to in order to survive on unemployment or if you had another sudden change in your expenses. If you make the plan now, it will be easier to put it into place when and if the time comes. At the beginning of a crisis you may not be thinking clearly, and it helps to have a plan already laid out that you can follow. Is It Better to Take Financial Risks or Be Financially Conservative? Short on Cash This Month? Here's What to Do.